In 2017, the population of the Kingdom of Saudi Arabia was about 32.55 million, compared to 31.47 million according to the demographic survey of 2016, with an average annual growth rate of 2.52 per cent, according to the General Authority for Statistics. The population comprised 57.48 per cent males and 42.52 per cent females in 2017, with 135 males for every 100 females. The rates are close to those of the 2016 demographic survey, with 57.44 per cent males and 42.56 per cent females. According to the survey, the number of Saudi citizens is around 20.41 million, or 62.69 per cent of the population, compared to 20.07 million in the 2016 demographic survey – a 1.7 per cent increase. In 2017, the gender split for Saudi citizens was 50.94 per cent for males and 49.06 per cent for females. These rates are similar to 2016, when males made up 50.96 per cent of the population and females 49.04 per cent. The population of non-Saudis (expatriates) is estimated at 12.14 million, or 37.3 per cent of the population in 2017, compared to 11.40 million in 2016, or 36.2 per cent of the population. The expatriate growth rate is 6.5 per cent. Arabic is the official language. Arabs account for 90 per cent of the population, while Afro-Asians account for the remaining 10 per cent. 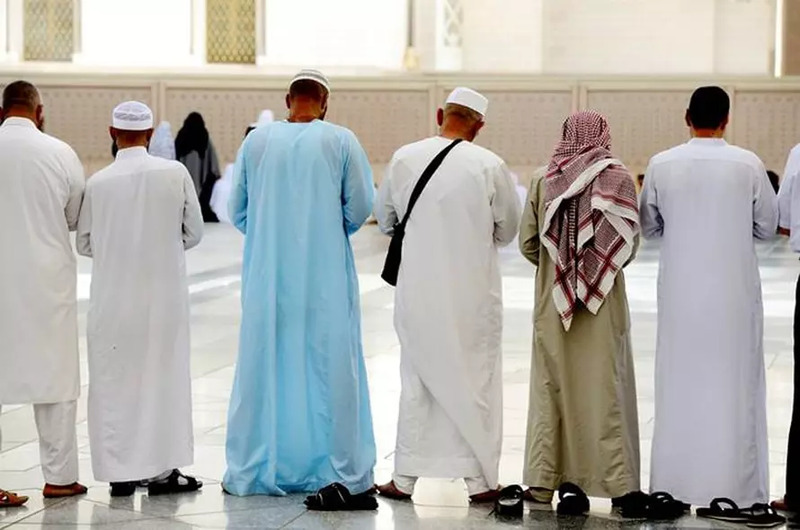 Islam is the official religion, and the percentage of Sunni Muslims ranges between 85 per cent and 90 per cent, compared to 10-15 per cent of Shia Muslims. There are also undefined numbers of Eastern Orthodox, Protestants, Roman Catholics, Jews, Hindus, Buddhists and Sikhs, according to the CIA’s World Factbook. Saudi society is youthful, with 24.7 per cent of the total population under the age of 15, 30.3 per cent of which are Saudi citizens, according to the 2017 census; 66.4 per cent of the total population is aged 15-54, with Saudis making up 60 per cent of this age group; 5.7 per cent of the total population is aged between 55-64 years, with Saudis making up 5.5 per cent of this group; those aged 65 and over account for 3.2 per cent of the total population, 4.2 per cent of which are Saudis. In 2017, the total fertility rate was two births per woman, while the fertility rate for Saudi women stood at 2.35 births per woman, which is close to 2016’s rate of 2.4 births per Saudi woman.. In 2017, the average life expectancy was 75.5 years for Saudis (73.4 for males, 77.7 for females), according to the CIA’s World Factbook. Due to the vast area of the country (2.15 million km2), Saudi Arabia is one of the least densely populated countries in the world. It recorded 15.1 people/km2 in 2017. The annual urbanization rate is 2.17 per cent, and the population of the kingdom is distributed geographically into 13 administrative regions. According to the CIA’s World Factbook and 2018 estimates, nearly 50 per cent of the population lives in the main urban areas: Riyadh (capital) with 6.91 million; Jeddah with 4.43 million; Mecca with 1.97 million; Medina 1.43 million and Dammam with 1.20 million people. The overwhelming majority (90 percent) of the native population of Saudi Arabia is Arab. Some Saudis are of mixed ethnic origin, being descendants of Turks and Iranians. Around 10 percent have an African or Asian (Indonesian or Indian) background, most of whom immigrated as pilgrims and reside in the Hijaz region, along the Red Sea coast. Since the oil boom in the 1970s, many non-nationals including Arabs from nearby countries, as well as significant numbers of Indians, Pakistanis, Bangladeshis, Indonesians, Filipinos, and Westerners, are employed in the kingdom. Most of them work in the oil and construction industries, as teachers and computer technicians and consultants, and as domestic workers. Saudi Arabia is one of the largest labour markets in the world. In 2017, the number of non-Saudi workers (expatriates) was estimated at 12.14 million, or 37.3 per cent of the population, compared to 11.40 million in 2016 or 36.2 per cent of the population, with a growth rate of 6.5 per cent. 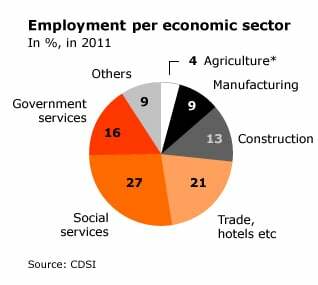 Non-nationals work mainly in the industrial and service sectors. The system of kafala (sponsorship) is the practice by which a foreign worker is invited via a business contract to work in Saudi Arabia, under the sponsorship of a kafil (employer). The system requires the foreign worker to seek permission from his sponsor to change jobs or leave the country. This subjects workers to abuse and control by their employers. The Ministry of Labour announced in May 2012 that it had banned all restrictions an employer might enforce on a worker, such as not being able to change jobs or the withholding of passports. In an attempt to scrap the sponsorship system, the Saudi Labour law was amended. Technical terms were changed, such as employer instead of sponsor, and transfer services instead of transfer sponsorship. Furthermore, the relationship between employer and worker is to be defined in a contract. The Ministry’s move is seen as a positive step to protect migrant workers rights, yet according to Human Rights Watch, Saudi Arabia would also have to amend its Residency Law in order to fully remove the risks of the system. Migrant workers’ residency permits are linked to their employer’s residency, requiring them to obtain permission from their employer (who is considered as their sponsor) to change jobs or leave the country. The private employment agencies, which the workers’ sponsorship would be transferred to, also still pose a risk to workers, since such agencies do not have a clean record. Human Rights Watch has documented cases in which existing Saudi employment agencies have abused migrant workers, from deception about employment contracts and refusal to help workers leave employers to physical abuse. While recruitment agencies are not allowed to charge workers any fees, there have been cases in which agencies have violated this rule but were not penalized. Saudi Arabia’s population is Muslim: 85-90 percent are Sunni, the remaining 10-15 percent are Shiite. Sunnis adhere to an ultraorthodox branch of Islam, generally known as Wahhabism. The branch takes its name from the alim (cleric) Muhammad ibn Abd al-Wahhab, who was born in 1703 in the village of Uyayna in Najd. Throwing in his lot with the emir of the neighbouring oasis al-Diriya, Muhammad ibn Saud, the Wahhabi faith spread across the Arab Peninsula in the wake of the military expansion during the 18th century. Muhammad ibn Abd al-Wahhab’s followers actually call themselves Muwahhidun (Unitarians), ‘those who believe in the unity of God’ (tawhid). At its core, Wahhabism strives towards a strict observance of the doctrine of the first Muslims, the Salaf, rigorously abandoning unorthodox practices which have been embraced by Muslims in the course of time (such as the reverence of holy men). Based on a ruling issued by the Prophet Muhammad, Wahhabism does not tolerate any other religion besides Islam in the land where it was revealed to the Prophet Muhammad. The activities of the Wahhabis have also put severe pressure on the position of the Shiites in Saudi Arabia. The Wahhabis regard Shia Islam as a form of heresy, and strove against the Shiites from the early days, often with use of violence. Since Sunni Islam is the only publicly observed religion in Wahhabi controlled territory, public displays of faith by Shiites were therefore long forbidden and suppressed. Nowadays these are tolerated to a certain extent. Shiites nonetheless remain second-class citizens in their own country. Public display of faith of non-Muslim migrants (mainly Christians and Hindus) by summons to prayer or by having a space for worship is prohibited by law. Many non-Muslims can however observe their religious practices in their private houses or residential compounds. The origins of Islam lie in what is today Saudi Arabia. Muhammad ibn Abd Allah, who was to become the founder of Islam, was born in Mecca circa 570 CE. In 613, after he had his first revelations, the Prophet Muhammad started preaching. In 622, he and his followers were invited to move to Yathrib (later renamed Madinat al-Nabi – City of the Prophet, or Medina). This move, the Hijra (Emigration) and the year in which it took place, 622, became the starting point of the Islamic calendar. The Hijra also was the starting point of the nation building that Muhammad undertook – with success, although it took him almost ten years. From Medina, he conquered the whole of the Arabian Peninsula and united the Arabs under the banner of Islam. After the death of the Prophet Muhammad in 632 CE, there arose two different camps within the umma (Muslim community) with regard to his succession, the Sunnis and Shiites. The designation ‘Shiite’ goes back to the Arabic term shiat Ali (Party of Ali). The followers of Ali ibn Abi Talib, the cousin and son-in-law of the Prophet Muhammad, were united in this party. On the basis of personal promises believed to be made by Muhammad, Ali obtained the leadership within the umma (his party termed this leadership the imamate) for himself and his descendants. The Sunnis, whose name derives from the sunna (the tradition of the Prophet) argued for rule by a chosen leader (which rule they termed the ‘caliphate’). Although Ali, regarded by the Shiites as their first imam, was chosen as the fourth caliph by the Sunnis (as successor to the caliphs Abu Bakr, Umar, and Uthman), the conflict between the two main branches of Islam over leadership escalated after his death. The schism between the Sunnis and Shiites deepened after 680 CE with the battle near Karbala, where the Shiites, now led by one of Ali’s sons, Husayn, were defeated in an unequal contest. Husayn and his companions were slain. After the Prophet’s death in 632, his followers continued his mission, which resulted in territorial conquest. Although there were tribal conflicts in the Arabian Peninsula, the conquest of the regions to the north was relatively expeditious, for several reasons. Firstly, the Byzantine Empire had been weakened by wars and internal conflicts, and the population in Asia Minor was weary of its rulers. Secondly, the Arabs deployed friendly tribes – related to those already established in the region – to conquer these populations. The first dynasty of caliphs to govern these regions, the Umayyads (661-750), governed from Damascus. The centre of the Islamic empire thus moved away from the Arabian Peninsula, although the Holy Cities of Mecca and Medina retained their pivotal religious significance for Muslims. The Umayyad dynasty was succeeded by that of the Abbasids (750-1258), whose administrative centre lay in Baghdad. For all Muslims there are five obligations – called the Five Pillars of Islam: the creed of faith (‘There is no God but Allah, and Muhammad is His Prophet’), prayer five times a day, the giving of alms, fasting during the month of Ramadan, and pilgrimage to Mecca. To the Five Pillars can be added the obligation of every Muslim to engage in jihad, the struggle to defend the community of believers (umma) against attacks by the infidel. Daily life in Saudi Arabia is dominated by Islamic observance. The authorities established the so-called ‘Commission for the Promotion of Virtue and Prevention of Vice’, a state religious police unit, to enforce religiously conservative rules of behaviour. Islamic Law (Sharia) is the basis of the legal system. Offenders of the law face physical punishment, in serious cases the death penalty. Religious functionaries (ulama) are distinguished by their functions: imam (leader of communal prayer), qadi (judge), and mufti (legal scholar). The latter has authority to issue fatwas (a juristic ruling concerning Islamic law). Sunni ulama have a key influence in major government decisions, they run the judiciary, play a significant role in the education system and have a monopoly of authority in the sphere of religious and social morals. Mecca and Medina are important pilgrimage centres for millions of Muslims every year. The cities are visited year round but especially during the pilgrimage season, when around two million pilgrims arrive to perform the rituals. Only Muslims are allowed to enter the city and its surroundings. The Holy Mosques in Mecca and Medina have been continuously renovated and expanded since the creation of the Saudi state, to accommodate millions of pilgrims. Residents of the residential and commercial areas around the mosques, some of which are historical and of religious value, have had to be relocated to accommodate the expansion. More than 10,000 properties in Mecca have had to be demolished. The two cities thrived on trade and tourism for centuries and are now targets for further economic opportunities. The latest expansion of the Haram Mosque in Mecca is expected to house 1.5 million worshippers and to cost about USD 20 million. Other projects to support the transportation of pilgrims between the rituals and holy sites are also in place. 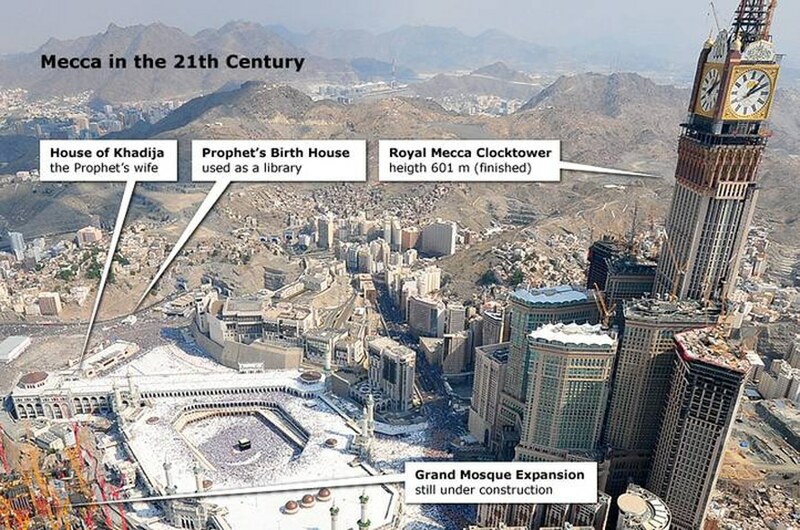 In Medina, King Abdullah has ordered an expansion of the mosque, in three phases, to house 1.6 million worshippers. The Hajj is one of the Seven Pillars of Islam: every Muslim must go on a pilgrimage to Mecca at least once in a lifetime, provided that he or she is physically and financially able to do so. The Hajj (great pilgrimage) falls between the eighth and twelfth day of the twelfth month of the Islamic calendar (Dhu al-Hijja). The Umra (lesser pilgrimage), in addition, can be undertaken any time of the year. The Hajj and the Umra are an important religious experience for Muslims. Co-religionists flock together from all corners of the world in the al-Masjid al-Haram (the Grand Mosque) in Mecca, where the Kaaba is located. There, hundreds of thousands of believers pray and perform a series of ritual acts, symbolic of the lives of Ibrahim (Abraham) and his second wife Hajar (Hagar). On the twelfth day, the Hajj is concluded with the Id al-Adha (Feast of the Sacrifice). Many pilgrims also visit the Holy City of Medina before or after the Hajj, 450 kilometres north of Mecca, where the oldest mosque, the Masjid Quba (Quba Mosque), and al-Masjid al-Nabawi (the Prophet’s Mosque) are located, and where the Prophet Muhammad is buried. The Hajj has been practiced by Muslims since the 7th century CE. Until well into the 20th century, the long journey to Mecca brought many perils. The introduction of modern transport facilities has greatly reduced the risks. Yet the journey remains hazardous – bringing health risks but also the perils involved when large crowds gather (in 2011 1.8 million pilgrims took part). Serious accidents have occurred in the past, leading to the deaths of hundreds of pilgrims. In politically unstable times – such as during the Islamic Revolution in Iran in 1979 – demonstrations by Iranian Shiites led to clashes with the Saudi police. For the Saudi authorities the Hajj has essentially turned into a large-scale logistical operation, in which the stream of pilgrims needs to be controlled. Its consulates and embassies strictly limit visas for visitors and pilgrims from each country every year to facilitate transportation and to minimize public-health hazards and other risks associated with overcrowding. Local pilgrims residing in Saudi Arabia are allowed to perform the Hajj only once every five years to accommodate others and to control the numbers during the days of the Hajj. Most pilgrims arrive via the airport at nearby Jeddah, others travel over land. From there, they are transported to Mecca by bus. There, they are accommodated in hotels, and especially in huge encampments just outside of the city. Separate access roads lead to the encampments in order to avoid chaos. The camps offer shelter, sanitary, medical and catering facilities. More than 100,000 policemen are responsible for maintaining order. Masjid Nabawi, Medina – and the pilgrimage to Mecca and Medina in general – was once the most important source of revenue for the region. Today, religious tourism still lards the Saudi coffers (in 2012 about USD 40 billion). However, these revenues pale before the annual revenues from the export of oil. Saudi Arabia is one of the top migrant destinations worldwide, preceded only by the United States, the Russian Federation, and Germany. Most of the migrants in Saudi Arabia are from South and East Asian countries. United Nations records show that, between 2005 and 2010, the net number of migrants residing in Saudi Arabia was 1,055,000. The total number of migrants recorded from 1950 to 2010 was approximately 6,237,000. In addition, an estimated 70,000 persons live in Saudi Arabia as refugees, asylum seekers, and stateless persons, according to UNHCR reports. Because Saudi Arabia did not sign the United Nations 1951 Refugee Convention, national laws determine how the refugees and stateless persons are handled by the local authorities. The large migrant population of Saudi Arabia explains the high rate of remittance, the rate of money sent abroad by migrant workers, amounting to about USD 26 billion in 2009, according to the World Bank. 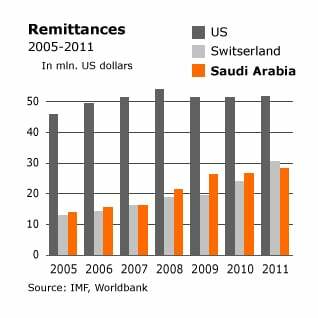 Saudi Arabia is considered the second highest sender of remittances, after the United States. Saudi Arabia’s government controls most economic activities in the country. The economy is based largely on oil production and exportation. In recent decades, Saudi Arabia has adopted several development plans aimed at improving the national economy and diversifying the revenue sectors, with an overall goal of increasing the Saudization of the job market. The mining and industrial economic sectors in Saudi Arabia are operated largely by migrant workers. The Ministry of Labour estimated that 1,100,000 visas for migrant workers are issued annually in Saudi Arabia. Saudi Arabia has been a member of World Trade Organization since 2005 and has been active in attracting foreign investments. To diversify its economy and attract foreign investments, Saudi Arabia has been developing economic and industrial cities throughout the country (during the last three decades). The industrial cities of Jubail on the Gulf coast and Yanbu on the Red Sea coast were already developed in 1976. Industrial cities focus on six key sectors: metals and minerals; automotive; plastics and packaging; consumer appliances; and construction materials, including solar energy products. Examples are Sudair Industrial City near Riyadh, and Jazan Economic City in the south-west. In recent years, more cities have been announced to stimulate other sectors, such as education and innovation (for example Knowledge Economic City in Medina). Six city construction projects have been developed since 2010, at an approximate cost of USD 373 billion, to attract foreign investments and boost the economy. Saudi Arabia’s economy is currently guided by the Ninth Development Plan, as designed by the Ministry of Economy and Planning. The plan has thirteen objectives, including lessening the dependency on oil, decreasing the unemployment of citizens due to the high recruitment of foreign workers working for lower wages, and promoting more sustainable development. A comprehensive strategy to combat poverty is in place to provide the poor with opportunities to participate in the economy and assist them in improving their standard of health and living. The plan was created to support balanced economic development, empowerment and employment of the poor, development of human capital, expansion of the social safety net, and improving the institutional environment and administration. Between 1990 and 2015, the first of the Millennium Development Goals (MDGs) was to halve the proportion of people living on an income of less than USD 1 a day. In 2009, the Ninth Development Plan reported that 0.06 percent of families in the Saudi population live on a per capita income of less than two dollars a day; 0.05 percent of the population lives below the extreme poverty level, less than USD 1 per day. Measures have been introduced to combat the high unemployment rate among Saudi nationals and the dependency on foreign labour. Though the literacy rate among persons between 15 and 24 years of age is high, at 98 percent, the skills obtained in education do not meet the demands of the market. In particular, the service and industrial sectors rely largely on foreign labourers, who are paid lower wages. 1.1 million visas are issued annually for foreign workers in Saudi Arabia, mainly in the private sector. For each Saudi employed in the private sector, thirteen foreign workers are employed. It was found to be 12.2 percent, with 6.6 percent among men and 34 percent among women. The service sector employs the highest proportion of Saudis, at 28 percent, followed by the engineering sector, at 27 percent. Saudis work as technicians in professional and humanitarian fields (11.7 percent), as professional specialists (10.8 percent), and as sales people (9 percent). The lowest proportions (less than 5 percent) were found in managerial positions, clerical work, agriculture and fishing, and industry. In 2011, in response to calls for reform, Saudi Arabia’s King announced a subsidy package to address economic complaints. The monetary package of USD 130 billion was intended to increase the salaries of civil servants and improve housing and employment benefits.